[center][url=http://www1.flightrising.com/forums/ann/2452352][img]http://flightrising.com/dropbox/banner_eyetypes02.png[/img][/url][/center] Just like that, we're rounding the corner on our [b]fifth[/b] year since [i]Flight Rising[/i] first spread its wings and launched into this incredible journey. Today, we are thrilled to celebrate the occasion with the debut of [b]Eye Types[/b], a new feature that will [b]allow dragons to randomly be born with rare, diverse, and more visually interesting eyes[/b]. Certain types can also be [b]applied via specialty items[/b] found in the Marketplace. 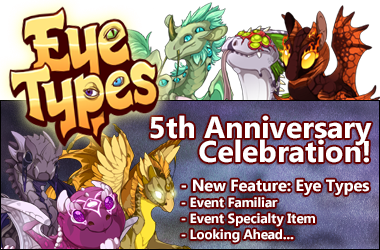 [center][url=http://www1.flightrising.com/forums/ann/2452352][b]Click here to learn more about today's celebration! [/b][/url][/center] [more] [size=5][b]Our Thanks for Five Awesome Years[b][/size] [i]Flight Rising[/i] has been a passion project for our team, and we're blown away that it's our [i]fifth[/i] birthday! We would not have reached this milestone without you. The dedication, creativity, generosity, and support you've given to both us and your fellow players inspires us to always move forward and do better. To those of you who jumped in feet first with us during the Kickstarter and early testing periods, thank you. To those of you who have found their way to Sornieth over the last few years, thank you. And to those couple players who literally logged in for their first time today, hello and welcome! (and thank you!) We are very fortunate to have you here as part of the [i]Flight Rising[/i] community. As a part of our [b]five year anniversary[/b] celebration, we want to recap some fun stuff, debut our newest feature, give you an update on the state of the game, and share with you some of our forward-looking plans. [size=5][b]What a Year! [b][/size] Let's look back on some of the fun stuff that happened in the [b]last year[/b]! [LIST] [*]The [b]Dressing Room[/b] launched during our last anniversary celebration, and since then, you've made [b]over 270,000 outfits[/b]! [*]Joxar expanded his festival business to include hawking his [b]spare inventory[/b], as well as selling some never-before-seen recolors to some favorite items of past celebrations. [*]A [b]load of new genes[/b] started weaving their way through the draconic gene pool: [LIST] [*]Jaguar [*]Rosette [*]Capsule [*]Bee [*]Tapir [*]Striation [*]Wasp [*]Pinstripe [*]Trail [*]Ghost (!!) 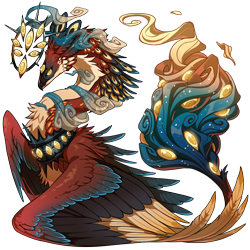 [*]Filigree [*]Python [*]Morph [/LIST] [*]Dragons expanded their already huge [b]wardrobe[/b] with healer's raiments, celestial jewelry, druidic garb, plumed feathers, prancing puppers, and long silky locks. [*]In addition to the brand new [b]Blooming Grove[/b] venue, both the [b]Arena[/b] and the [b]Waterway[/b] received new artwork, monsters, and loot. [*]We launched the first of our self-service player support initiatives: [b]Dragon Restorations! [/b] [*]After a long developmental journey, Coliseum was [b]refactored[/b], beta tested, and launched, bringing [b]custom battle parties[/b], [b]battle stone rearranging[/b], and [b]keyboard controls[/b]. [*]The [b]exaltation pillars[/b] for each flight have new artwork that reflects the beauty and spirit of each element. [*][i]Flight Rising[/i] finally swung wide its doors for [b]open registration[/b], welcoming back new and old players alike during the [i]Bounty of the Elements[/i] event, which brought with it the [b]Swiftbrood Boon[/b], the [b]Which Waystone[/b], [b]Bonus Coliseum XP[/b] and [b]Gems[/b] promotions, a new [b]player reporting system[/b], and ten new pieces of [b]official lore[/b]. [/LIST] [size=5][b]Eye Types[b][/size] As of this posting, our [b]Eye Types[/b] feature is now live! After the world-rending events of [i]Bounty of the Elements[/i], the magic in each clan has intensified, and dragons that are born to this new Sornieth will start to manifest interesting changes to their eyes. Eye Types are a new layer of visual customization to the dragons of [i]Flight Rising[/i], and there are [b]two ways[/b] for you to experience this new feature. [indent][size=4][b]Natural Eye Types[b][/size] Each new dragon [b]born[/b] (whether by hatching from nests or unhatched egg items) [b]will have a chance to manifest one of several [i]natural[/i] eye types[/b]: [LIST] [*][b]Common[/b] (which all currently-existing dragons have) [*][b]Uncommon[/b] (a different “tint” of the element color) [*][b]Unusual[/b] (a different “tint” of the element color) [*][b]Rare[/b] (a different “tint” of the element color) [*][b]Faceted[/b] (a bug-like fractured eyeball) [*][b]Multi-Gaze[/b] (multiple eyes all over the dragon’s body) [*][b]Primal[/b] (a powerful physical manifestation of the dragon’s element, like flames or goop) [/LIST] Below are examples of the [b]natural eye types[/b] you'll have a chance of seeing in breeding right away. : [center][img]http://flightrising.com/dropbox/preview_eyetype_babbins001.png[/img] [img]http://flightrising.com/dropbox/preview_eyetype_babbins002.png[/img][/center] [size=4][b]Unnatural Eye Types[b][/size] It will also be possible to manually apply the [b]Glowing[/b] eye type using a [b]specialty item[/b] that can be purchased in the [b]Gem Marketplace[/b]. [center][img]http://flightrising.com/dropbox/light_skydancer_glowing.png[/img][/center] [center][item=Vial of Glowing Sight][/center] [size=4][b]Are These Just a "Quaternary Gene"? [b][/size] [b]No. Eye types are not genes and are not passed down from adults to hatchlings via the breeding system[/b]. This means [b]all hatchlings have the same chances[/b] to manifest these visual changes upon hatching. As the eye type names above imply, some will manifest more often than others. Since the [b]natural eye types cannot be selectively bred for or purchased through the marketplace[/b], every player has the same chance for their hatchlings to join the world with a little extra special [i]something[/i]. [size=4][b]Short Story: Aftershocks[b][/size] To accompany the launch of the feature, we've written a new short story called [url=http://flightrising.com/main.php?p=wiki&article=102][b]Aftershocks[/b][/url]. Check it out! 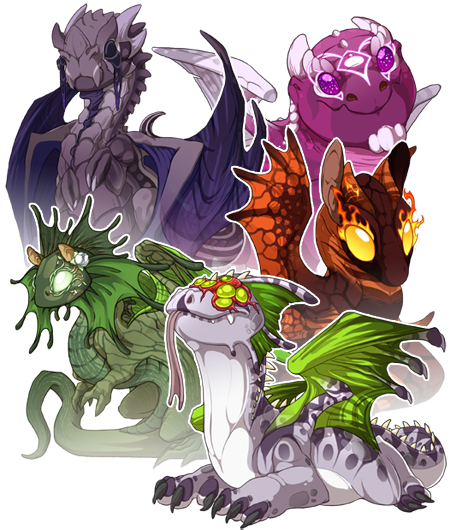 [center][url=http://flightrising.com/main.php?p=wiki&article=102][img]http://flightrising.com/dropbox/aftershock_button.png[/img][/url][/center] [/indent] [size=5][b]Vial of Scattersight & Event Familiar[b][/size] As part of the festivities, we have granted our current players a [b]Vial of Scattersight[/b] and the [b]Slight Eyewing[/b] familiar. The Vial of Scattersight operates in a similar way to the Tri-Color Scatterscroll (but for eye types instead), in that will [b]apply a random natural eye type to the dragon it's used on[/b] (excluding the default “common” eyes that have been available since the site launched.) This allows currently existing dragons a chance at the new natural eye types. [b]These special vials are available only during this event[/b]! Both items have been [b]deposited automatically to your hoard[/b]. [center][img]http://flightrising.com/dropbox/eyeballbird.png[/img] [item=Vial of Scattersight][/center] You can also [b]brew[/b] both items at [b]Baldwin’s Bubbling Brew[/b], and find additional Vials of Scattersight as [b]Coliseum loot drops[/b] during this event. The recipes and loot drops will remain active until [b]Sunday, June 10th, 23:59 Server Time[/b], after which point they will [b]retire permanently[/b]. [size=5][b]Looking Toward the Future[b][/size] In addition to celebrating how far we've gotten, we wanted to also take the opportunity to reaffirm to you our [b]commitment to the future[/b]. [i]Flight Rising[/i] is an expanding and evolving experience, and one our team remains fully invested in. Just this past year, we added additional engineering support, expanded our art and volunteer moderator teams, and performed a plethora of infrastructural player support code work, all with a clear goal in mind to keep making [i]Flight Rising[/i] the best that it can be. To demonstrate our commitment to you and our game, we'd like to share with you some early details about some [b]feature initiatives[/b] in our sights for this coming year [i](June 2018 - June 2019)[/i]. [b]NOTE[/b]: As with all our developer updates, [b]the information we are sharing is subject to change[/b] as the project progresses. Game features are completed based on priority, timing, feedback, or (Stormcatcher forbid!) a showstopping bug. [indent][size=4][b]Dragon Storage Improvements and the Hibernal Den[b][/size] Dragon storage and organization are some of the oldest systems on the site and next in line for a rehaul! Over the years we’ve collected feedback, done research, and have a pretty good idea how we’d like to move forward with making changes. While these may not reflect the final functionality of the feature, our goals are twofold: Firstly, we will be implementing a way to [b]organize dragons into specific groups[/b] or “tabs”. For instance, say that you have several dragons that are themed to look like flowing lava. You might create and label a tab “Lavaflow Dragons” and move all of those dragons into it. It would then be simple to jump over and look at them by clicking that group’s tab at the top of your dragons page. While we’re still discussing it, our initial plans are to give all players several free tabs to play around with and the ability to unlock additional tabs with treasure. Along with better grouping options, we would like to introduce better [b]searching[/b], [b]sorting[/b], and [b]filtering[/b] options so that it’s far easier to find the dragon or dragons you’re looking for. Secondly, there will be an additional storage area called the [b]Hibernal Den[/b]. Over the years, we have seen lots of desire for [b]a place to showcase and store dragons you love, but don’t plan on having interact with the rest of the site[/b] all the time (i.e. breeding, coliseum, trading, etc.) and more importantly, not depleting your food stores or averaged clan energy. A type of “dragon gallery” or “dragon vault”, if you will. The Hibernal Den would be a place to move dragons you still want to keep, but don’t plan on using for gameplay in the near future. This storage system would allow your dragons to hibernate, retaining their current apparel, familiars, and biographies, allowing you to share and collect them. Of course, you will be able to remove them from the Hibernal Den to rejoin your active dragons, but a period of time will need to pass before they can hibernate again. We’re still tossing around several ideas for this revamp, but look forward to more information in upcoming [b]Developer Updates[/b]! [size=4][b]An Updated, Interactive World Map[b][/size] As we continue to expand the lore and world of [i]Flight Rising[/i], we want to make sure the cartography matches! One of our projects this year is to [b]revitalize our world map with newer, more detailed artwork and add a sleeker level of interactivity[/b]. The events of [i]Bounty of the Elements[/i] ushered forth [b]brand new areas[/b] (a whole new [i]volcano[/i], anyone? ), shed light on some that were once [b]insignificant[/b] (places like [i]Dripcave Dregs[/i] and [i]Thorndark Altar[/i]), and have created new [b]dangers and perils[/b] to avoid (an [i]emperor[/i] now roams...), so it only makes sense that we highlight these on our map! In addition to areas mentioned in the new lore, we have a few [b]new places of interest[/b] that dragonkind have been cultivating in their distinct realms, but you'll just have to wait and see what those end up being! Functionally, we will be moving away from eleven separate pages to showcase each flight’s homeland, instead opting for a map with the ability to [b]zoom[/b], [b]pan[/b], and [b]animate[/b]. Information and lore about each area and its landmarks will be easily called up with the click of your mouse or a tap of your finger, depending on how you visit the site. [/indent] [size=5][b]Full Steam Ahead! [b][/size] As we mentioned above, we’re [b]all in[/b] on [i]Flight Rising[/i], and really excited to kick off another exciting year with you all. Your adventures in Sornieth make the whole project worth working on, and we hope to create many more activities and memories for you to enjoy in the coming months and years. Hope you enjoy the celebration! Just like that, we're rounding the corner on our fifth year since Flight Rising first spread its wings and launched into this incredible journey. Today, we are thrilled to celebrate the occasion with the debut of Eye Types, a new feature that will allow dragons to randomly be born with rare, diverse, and more visually interesting eyes. Certain types can also be applied via specialty items found in the Marketplace. Click here to learn more about today's celebration! Flight Rising has been a passion project for our team, and we're blown away that it's our fifth birthday! We would not have reached this milestone without you. The dedication, creativity, generosity, and support you've given to both us and your fellow players inspires us to always move forward and do better. To those of you who jumped in feet first with us during the Kickstarter and early testing periods, thank you. To those of you who have found their way to Sornieth over the last few years, thank you. And to those couple players who literally logged in for their first time today, hello and welcome! (and thank you!) We are very fortunate to have you here as part of the Flight Rising community. As a part of our five year anniversary celebration, we want to recap some fun stuff, debut our newest feature, give you an update on the state of the game, and share with you some of our forward-looking plans. Let's look back on some of the fun stuff that happened in the last year! The Dressing Room launched during our last anniversary celebration, and since then, you've made over 270,000 outfits! Joxar expanded his festival business to include hawking his spare inventory, as well as selling some never-before-seen recolors to some favorite items of past celebrations. Dragons expanded their already huge wardrobe with healer's raiments, celestial jewelry, druidic garb, plumed feathers, prancing puppers, and long silky locks. In addition to the brand new Blooming Grove venue, both the Arena and the Waterway received new artwork, monsters, and loot. We launched the first of our self-service player support initiatives: Dragon Restorations! After a long developmental journey, Coliseum was refactored, beta tested, and launched, bringing custom battle parties, battle stone rearranging, and keyboard controls. The exaltation pillars for each flight have new artwork that reflects the beauty and spirit of each element. Flight Rising finally swung wide its doors for open registration, welcoming back new and old players alike during the Bounty of the Elements event, which brought with it the Swiftbrood Boon, the Which Waystone, Bonus Coliseum XP and Gems promotions, a new player reporting system, and ten new pieces of official lore. As of this posting, our Eye Types feature is now live! After the world-rending events of Bounty of the Elements, the magic in each clan has intensified, and dragons that are born to this new Sornieth will start to manifest interesting changes to their eyes. Eye Types are a new layer of visual customization to the dragons of Flight Rising, and there are two ways for you to experience this new feature. It will also be possible to manually apply the Glowing eye type using a specialty item that can be purchased in the Gem Marketplace. Are These Just a "Quaternary Gene"? No. Eye types are not genes and are not passed down from adults to hatchlings via the breeding system. This means all hatchlings have the same chances to manifest these visual changes upon hatching. As the eye type names above imply, some will manifest more often than others. Since the natural eye types cannot be selectively bred for or purchased through the marketplace, every player has the same chance for their hatchlings to join the world with a little extra special something. To accompany the launch of the feature, we've written a new short story called Aftershocks. Check it out! As part of the festivities, we have granted our current players a Vial of Scattersight and the Slight Eyewing familiar. The Vial of Scattersight operates in a similar way to the Tri-Color Scatterscroll (but for eye types instead), in that will apply a random natural eye type to the dragon it's used on (excluding the default “common” eyes that have been available since the site launched.) This allows currently existing dragons a chance at the new natural eye types. These special vials are available only during this event! Both items have been deposited automatically to your hoard. You can also brew both items at Baldwin’s Bubbling Brew, and find additional Vials of Scattersight as Coliseum loot drops during this event. The recipes and loot drops will remain active until Sunday, June 10th, 23:59 Server Time, after which point they will retire permanently. In addition to celebrating how far we've gotten, we wanted to also take the opportunity to reaffirm to you our commitment to the future. Flight Rising is an expanding and evolving experience, and one our team remains fully invested in. Just this past year, we added additional engineering support, expanded our art and volunteer moderator teams, and performed a plethora of infrastructural player support code work, all with a clear goal in mind to keep making Flight Rising the best that it can be. To demonstrate our commitment to you and our game, we'd like to share with you some early details about some feature initiatives in our sights for this coming year (June 2018 - June 2019). NOTE: As with all our developer updates, the information we are sharing is subject to change as the project progresses. Game features are completed based on priority, timing, feedback, or (Stormcatcher forbid!) a showstopping bug. Firstly, we will be implementing a way to organize dragons into specific groups or “tabs”. For instance, say that you have several dragons that are themed to look like flowing lava. You might create and label a tab “Lavaflow Dragons” and move all of those dragons into it. It would then be simple to jump over and look at them by clicking that group’s tab at the top of your dragons page. While we’re still discussing it, our initial plans are to give all players several free tabs to play around with and the ability to unlock additional tabs with treasure. Along with better grouping options, we would like to introduce better searching, sorting, and filtering options so that it’s far easier to find the dragon or dragons you’re looking for. Secondly, there will be an additional storage area called the Hibernal Den. Over the years, we have seen lots of desire for a place to showcase and store dragons you love, but don’t plan on having interact with the rest of the site all the time (i.e. breeding, coliseum, trading, etc.) and more importantly, not depleting your food stores or averaged clan energy. A type of “dragon gallery” or “dragon vault”, if you will. The Hibernal Den would be a place to move dragons you still want to keep, but don’t plan on using for gameplay in the near future. This storage system would allow your dragons to hibernate, retaining their current apparel, familiars, and biographies, allowing you to share and collect them. Of course, you will be able to remove them from the Hibernal Den to rejoin your active dragons, but a period of time will need to pass before they can hibernate again. We’re still tossing around several ideas for this revamp, but look forward to more information in upcoming Developer Updates! As we continue to expand the lore and world of Flight Rising, we want to make sure the cartography matches! One of our projects this year is to revitalize our world map with newer, more detailed artwork and add a sleeker level of interactivity. The events of Bounty of the Elements ushered forth brand new areas (a whole new volcano, anyone? ), shed light on some that were once insignificant (places like Dripcave Dregs and Thorndark Altar), and have created new dangers and perils to avoid (an emperor now roams...), so it only makes sense that we highlight these on our map! In addition to areas mentioned in the new lore, we have a few new places of interest that dragonkind have been cultivating in their distinct realms, but you'll just have to wait and see what those end up being! Functionally, we will be moving away from eleven separate pages to showcase each flight’s homeland, instead opting for a map with the ability to zoom, pan, and animate. Information and lore about each area and its landmarks will be easily called up with the click of your mouse or a tap of your finger, depending on how you visit the site. As we mentioned above, we’re all in on Flight Rising, and really excited to kick off another exciting year with you all. Your adventures in Sornieth make the whole project worth working on, and we hope to create many more activities and memories for you to enjoy in the coming months and years. Hope you enjoy the celebration! WOWOWOWO! HAPPY ANNIVERSARY. FR! This is going to be one fantastic event! Excited to see how everyone's dragons are going to be made over with this new feature! Thank you all so much for your lovely work and dedication. While we might not always show our appreciation and instead complain, you guys are really the best team of developers, admins and even moderators that I've ever seen! You guys are constantly thinking ahead as to what you can add and are all genuinely fun to interact with. On the other hand this is gonna screw up SO MANY BREEDING PROJECTS FOR PEOPLE. Like if someone was breeding for a certain color combo and the eye color was the Main Thing™ about said breeding project and they ended up getting one of the types of new eyes that ISN’T what they wanted/what works well with said breeding project, they would be understandably angry about it. I really, REALLY hope staff create an item to change the eyes back to normal as well because if not tbh I think it could be a BIG breaking point for the community as a whole. OR don’t retire the eye scatter vials but instead change the drop rate to ridiculously rare and/or take away the brewing, AND make the common eyes an option if possible. Like if a dragon was born with Multi-eyes it could scatter back to common eyes. I think it could be added to the code that they can’t scatter to something it already has since from the sounds of it that’s sort of how it’s setup to begin with. Or maybe at least make them drop for a week since players may not have time to grind in two days for vials. These are just my thoughts about everything and I hope that my point get’s across without being too harsh. oh my god! eye types! that's so amazing. i especially love the multi-gaze, and some of the primal ones are sooo cool. i'm kinda disappointed with how random the chance to get a particular type is, but oh well. I collect G1s with Antique primary!